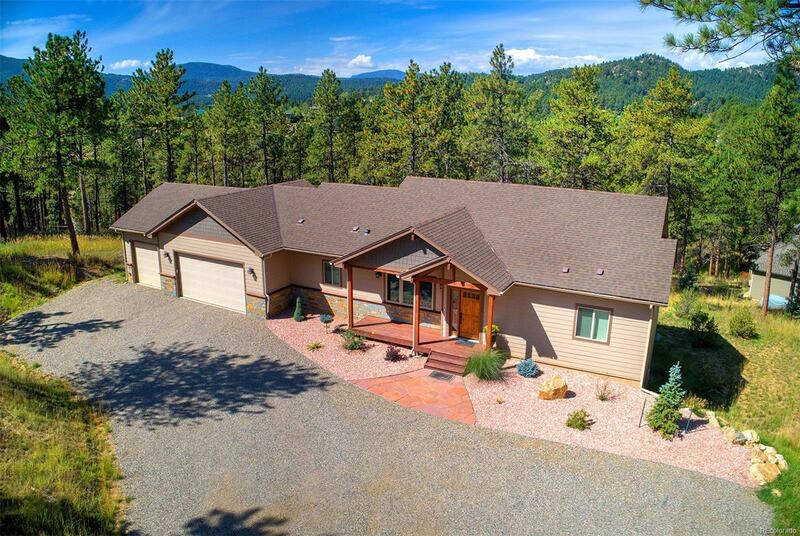 2016 Mountain Contemp in mint condition with main level living and an open floor plan. The main level has a vaulted great room w/hdwd flrs and gas fireplace that opens into a spacious kitchen with custom cabinets, granite counter tops, stainless steel appliances, pantry, large island w/breakfast bar and a gas stove top. Additionally, the laundry room is conveniently located off of the kitchen and garage, there is a large office off of the foyer, half bath and the vaulted master suite includes a spacious master bath and walk in closet. Downstairs with extra tall ceilings includes a family rm w/gas fireplace, wet bar, rec area, two bedrooms, full bath and the utility room. Walk out onto the flagstone patio to enjoy the large hot tub. Do not miss the oversized three car garage w/plenty of room for storage. Flat easy driveway and only minutes to shopping, schools, recreation or commute to the Denver metro area. Quiet and peaceful setting.